From not-for-profit organizations advocating for better solutions to private companies offering products and services to governments developing and implementing policy, a great deal of environmental activity occurs in, around and between organizations. envision helps strengthen environmental organizations so they can effectively carry out their mandates and work well with other organizations to achieve even greater impact. We identify and address obstacles to top performance and apply proven methods to overcome them. 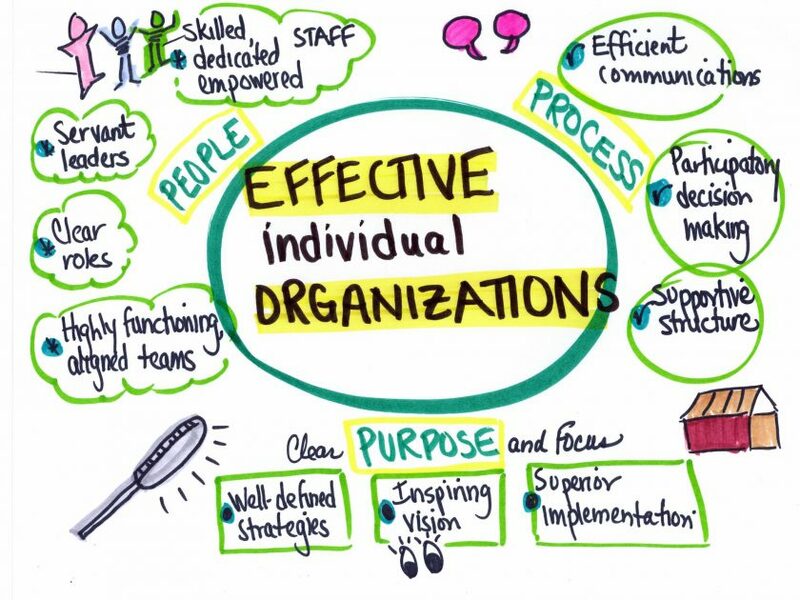 envision uses the tools and techniques of facilitation, graphic recording, evaluation and capacity building to help you reach your organizational goals. Great organizations focus on an inspiring vision supported by dedicated leadership; engaged, skilled staff; and highly functional teams. The organizational structure supports getting the work done and allows communications across silos. As natural systems thinkers, envision is eager to help you along that continuous journey. Strategic Planning workshops that hone your organizational focus and set direction for maximum impact. At the end you have a clear strategic vision and action plan. Building Partnerships both within your organization and with other organizations to expand your reach and reduce duplication. Team Building and Collaboration workshops, including True Colours Personality Strength Inventory to help you achieve superior team performance. We clarify team mandates and roles, work through impasses, while enabling you to see beyond organizational silos and foster systems thinking. Benchmarking and Organizational Assessment sessions to enable you to identify organizational strengths and challenges. Capacity Building sessions to build your knowledge and skills, and to learn from your peers. We lead meetings both at your office and at off-site at retreat centres (our favourite) and other interesting locations. These gatherings enable you to reflect and recharge, as well as increase your knowledge and/or work on a complex challenge with others. For a list of our projects promoting effective organizations, click here. Click here for a downloadable handout on elements to investigate in assessing your organization’s effectiveness. For more information: info@envision-synergy.net or 416-778-4713.